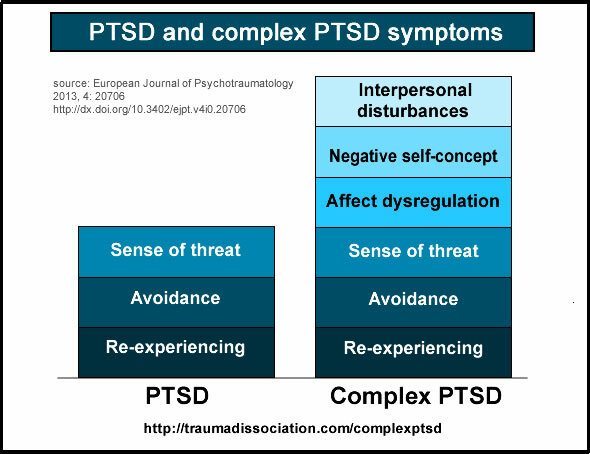 Dr Frank Ocher explains the wider impact of Complex PTSD. Interpersonal problems includes social and interpersonal avoidance (avoiding relationships), feeling distance or cut off from others, and never feeling close to another person. and re-experiencing or reliving the traumas, for example flashbacks and intrusive thoughts about the trauma. Recent research has produced detailed analysis of the symptoms of Complex PTSD, PTSD and Borderline Personality Disorder (BPD). Many people with BPD either have PTSD, or meet the proposed diagnostic criteria for Complex PTSD. Complex PTSD was shown to be a separate diagnosis from Borderline Personality Disorder because a significant number did not meet the diagnostic criteria for BPD (and vice versa). "Complex post-traumatic stress disorder (Complex PTSD) is a disorder that may develop following exposure to an event or series of events of an extreme and prolonged or repetitive nature that is experienced as extremely threatening or horrific and from which escape is difficult or impossible (e.g., torture, slavery, genocide campaigns, prolonged domestic violence, repeated childhood sexual or physical abuse). 3) persistent difficulties in sustaining relationships and in feeling close to others. The disturbance causes significant impairment in personal, family, social, educational, occupational or other important areas of functioning." Lasted updated May 31, 2016. Criteria last updated by WHO on May 29, 2016. The current ICD-10 includes a diagnosis of Enduring Personality Change After Catastrophic Experience (EPCACE) in the Disorders of adult personality and behavior section. This is regarded as equivalent to Complex PTSD. "Enduring personality change may follow the experience of catastrophic stress. The stress must be so extreme that it is unnecessary to consider personal vulnerability in order to explain its profound effect on the personality. Examples include concentration camp experiences, torture, disasters, prolonged exposure to life-threatening circumstances (e.g. hostage situations - prolonged captivity with an imminent possibility of being killed). Post-traumatic stress disorder (F43.1) may precede this type of personality change, which may then be seen as a chronic, irreversible sequel of stress disorder. In other instances, however, enduring personality change meeting the description given below may develop without an interim phase of a manifest post-traumatic stress disorder. Brain damage or disease which may cause similar clinical features must be ruled out. 3. World Health Organization. (May 31, 2016). ICD-11 Beta Draft (Joint Linearization for Mortality and Morbidity Statistics). 8. Williams, M. B., (2002). The PTSD workbook simple, effective techniques for overcoming traumatic stress symptoms . Oakland, Calif.: New Harbinger Publications. ISBN 160882148X. Complex Post-traumatic Stress Disorder. Traumadissociation.com. Retrieved from .